The idea behind these plans was to make an easy to build Stirling engine, that can be built by almost anyone. It runs on only one candle, which is a bonus, although I can't honestly say it moves much air. You'll need some materials and tools, they are listed below. 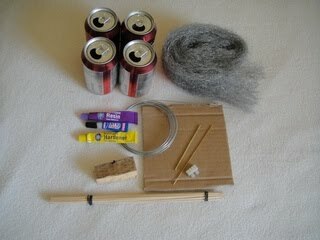 Some of the materials needed. This can will be the top can that holds the cranks. Remove the top with a can opener or scissors. You need to holes punched and drilled either side. To make sure that they were in line with each other, I made a paper template, you can skip doing this and just make the holes by eye, but I think it's worthwhile making the template. 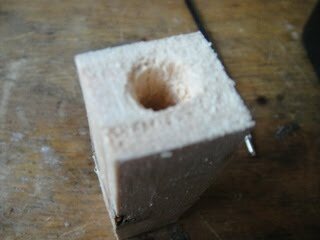 When you've punched the holes, drill them out with a 2mm drill bit. 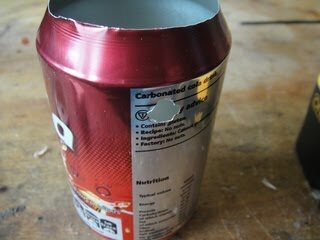 Punch a hole in the can, parallel to the direction that the cranks will run in with a knife. Use this to start your cut for the viewing hole in the front of the can. The bushing for the displacer shaft needs to sit in the centre of the can. I marked this using a caliper set to 33mm. Draw three arcs, they should intersect at the centre of the can. I punched a hole in the centre of the can to make sure that the drill bit didn't slip, then I drilled it out using a 2mm drill bit. The tubing for the bushing is 2.38mm, not 2, so you'll have to run the drill bit around the hole a few times to widen it. Step 3: A jig to glue the bushing in place. As there's nothing physically holding the bushing in place until the epoxy sets, you'll need a jig to hold it straight. The jig is just a scrap of wood with a 2mm hole drilled in it. There's a 1.59m brass rod is epoxied in this hole. Cut a piece of brass rod to about 50mm long and epoxy it in place. Whilst the epoxy is drying, keep checking that it's square to the wood with a square. Check all round with square. When the epoxy has dried, you can add a spacer. The purposes of this spacer is to hold the brass tube in the right place on the coke can, as the bottom of the can is dome shaped. The spacer is about 9mm long and made from the end of an ink cartridge out of a biro pen. Step 4: Cut and glue the bushing in place. Cut a piece of the 2.38mm tubing about 10mm long. 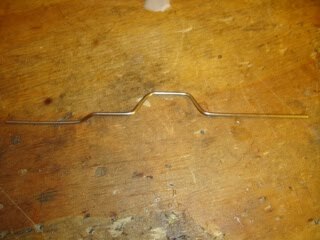 You can cut small diameter tubing by rolling the knife over it. Cutting the tube will leave tiny burrs on the inside of the tube, you need to remove theses using a knife, scrape around the inside of the cut edge tube with the tip of the knife. Test that the piece of tube slides over a piece of 1.59mm rod, it should fall under it's own weight. With the tube ready, you can place it on it's jig. Then place the coke can over the tube. 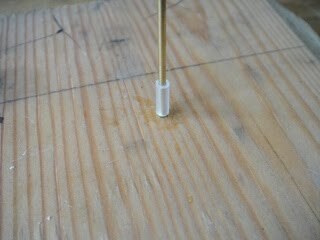 The jig should hold it in place, so you can epoxy the tube in place. Be careful not to get epoxy on the brass rod. The cranks are made from a bicycle spoke. I bent the cranks using pliers. 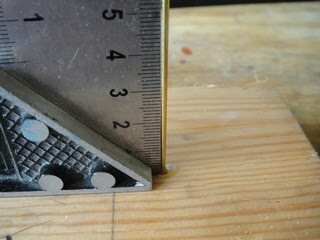 As you make them, keep checking the they running true, you can do this by laying them on a flat surface between where the two bearing points will be. A windowsill is ideal for this. 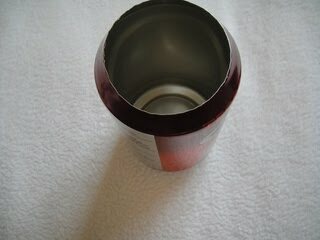 The displacer cylinder is just a coke can with a hole drilled it the side, and the top bevel cut off. Hole for air, remove the bevel too! The displacer is made from steel wire wool wrapped around a length of brass rod. 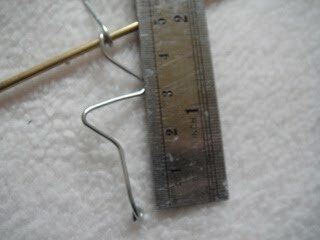 Cut your brass rod to 125mm long and bend a small hook on one end. This will keep the bottom cap from falling off. 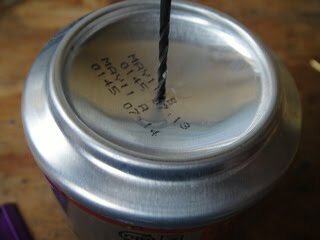 Take two coke cans, mark and drill the centre of these to 2mm as you did in step 3. 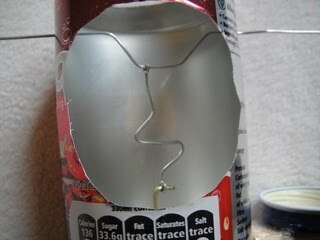 Cut the domes out of the bottom of the cans using tin snips. You'll need to make a depression in one of them to make space for the screw block. To hold the two caps together, I took a screw block, removed the plastic coating and sawed it in half using a hacksaw. 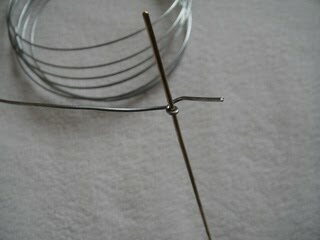 Now you can roll your steel wire wool around the brass rod. Keep wrapping it until it's about 5mm smaller than the displacer can. 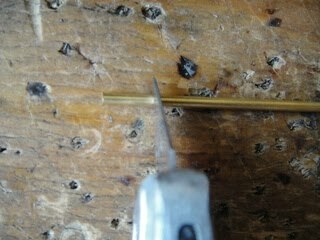 Remove the brass rod, and cut the roll of wool down to about 40mm using scissors. You can assemble the displacer now. 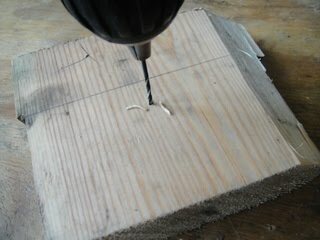 first put the bottom cap on the brass rod then push the wire wool onto the rod. Put the top cap on and then secure it with the screw block. When it's finished, the displacer should be about 35mm tall. You'll probably have to make adjustments until it will fall freely in the displacer can. Screw connector cut in half. The diaphragm sits on a a little piece of wood that's epoxied to the side of the displacer cylinder. The wood has two holes drilled in it to transfer air from the displacer cylinder to the diaphragm. Start by drilling a 6mm hole in the paste lid. 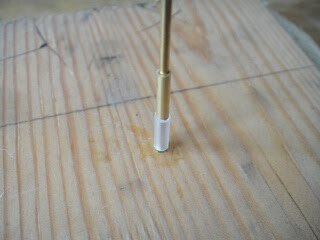 You can position the paste lid roughly and use this to mark the depth on your drill with a piece of tape. 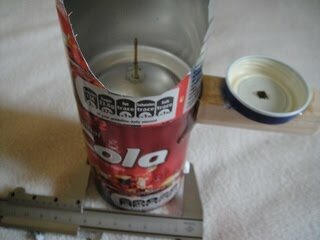 You want the paste lid about 1cm away from the end of the wood that will be glued to the coke can. 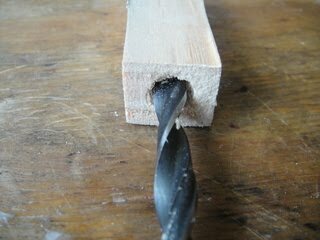 You can drill the two holes now, one in the end of the wood meeting up with another in the top of the wood, they should meet allowing air to flow through. File the edge of the wood that meets the into a curve to roughly match the curve of a coke can. With the holes drilled, you can epoxy the paste lid to the piece of wood, make sure the holes line up. Wait for that epoxy to dry, and then epoxy the piece of wood to the side of the displacer can, again making sure that the air holes line up. You'll have to hold the wood while the epoxy dries. It's important to use plenty of epoxy to seal the engine, as it must be air tight. 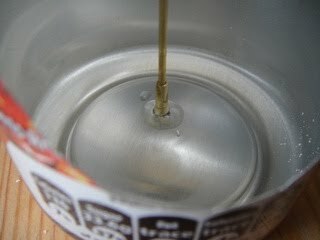 Even a very small air leak will stop the engine running, so it's better to use too much epoxy rather than too little. You can assemble the two parts of the engine now. Put the displacer in it's cylinder, and then push the top can into the displacer cylinder. Don't push the top can from the top, only push from the bottom through the viewing window. Test the displacer falls freely, it should fall under it's own weight with no obvious resistance. If it doesn't quite fall freely, you can adjust the position of the top can until it does. With the displacer moving as it should, you can bend the end of it to a right angle, so that it can be connected to the cranks in the next step. Ignore the cranks and connecting rod in the picture, that's covered later. I made the connecting rods for the displacer and diaphragm from 1.2mm wire. The ends are wrapped around the parts they connect to, to act as bearings. They have a zig zag bend, so that the length of them can easily be adjusted by stretching or compressing the zig zag. For the displacer connector, I bent one end around a piece of the 2.38mm tubing to connect to the cranks, and the other around a piece of 1.59mm tubing. For the diaphragm I bent one end around a piece of the 2.38mm tubing to connect to the cranks, and the other end around a piece of 1.2mm wire.